Home / Transportation / Checkout the Bay Area Shuttle Service! 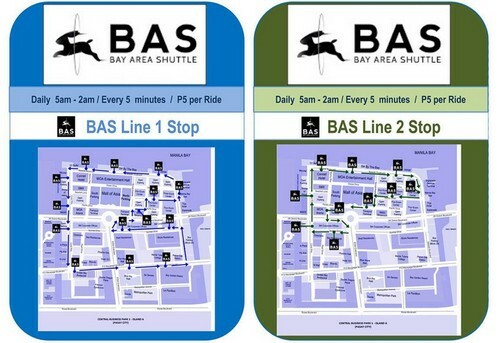 Checkout the Bay Area Shuttle Service! Another milestone for public commuters is now available at the Central Business Park (CBP) – Pasay City. Froehlich Tours Inc. in cooperation with Central Business Park Management and the Central Business Park Stakeholders launch a new transportation project BAS (Bay Area Shuttle) with effective of May 30, 2016. The new BAS service will connect up to 18 bus stops within the Central Business Park, Pasay City for a hop on and hop off bus service. The 2 initial routes will connect Mall of Asia, Bay Area, SMDC Condominium Projects, SMX, Convention Centre, Parking Areas, E-COM Centers, Office Buildings and Commuter Hubs. The service will start with 2 – 4 buses in a 5 minutes interval on a 30 days free trial period and will increase by 1st of July 2016 to 10 buses in a 5 minutes interval per stop. The new service will be charged with a fare of PHP 5.00 per ride and a PHP 300.00 monthly ticket with unlimited rides for one calendar month. The buses operated by Froehlich Tours Inc. will be a mix of MAN Lion’s City low floor entry buses and HIGHER 6129G low floor entry buses with wheelchair ramps and PWD facilities. All units will be powered by low emission EUR 4 and EUR 5 engines with speed limiters on 40 km per hour maximum speed, GPS monitoring System and CCTV security system within the buses. BAS will offer soon connections to MRT / LRT end stations, airport terminals, Coastal Mall bus terminal, Pasay bus terminal, SM Jazz Makati, SM Megamall, SM City North EDSA and SM BF by using brand new dedicated 8 – 12 seater vans and premium mini buses as well as our MAN Lion’s City and Higer 6129G low floor entry buses for frequented routes. 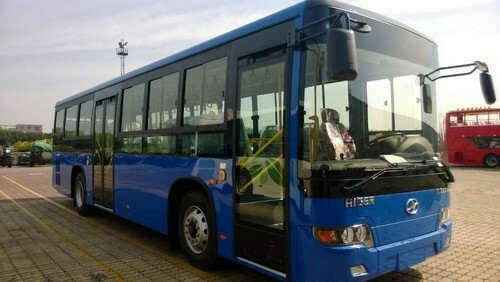 Our aim is to offer a reliable and affordable transport solution for Central Business Park‘s residents, visitors, and office workers, by providing modern and reasonable services to decongest the traffic situation and attract more people to use an advanced transport system for a greener Central Business Park Area.